One of my oldest and most favorite cookbooks – and the tattered and spotted condition of my copy certainly proves the age and status – is Barbara Swain's Cookery for 1 or 2. I may have bought it before I moved out of the women's barracks as a young Air Force sergeant. I was always cooking my own meals then, since the hours I worked were not compatible with the dining hall, and the barracks did have a primitive but functional kitchen. I definitely possessed this copy by the time I settled into a teeny studio apartment, as I clearly recall cooking many of the entrees and brunch dishes on the propane gas stove there. The marvelous thing about this particular cookbook is that every recipe in it was scaled for exactly one or two servings. The pound-cake recipe made a tiny 3 x 7 inch loaf of butter cake; the carrot cake recipe made exactly half a dozen cupcakes. Everything was perfectly scaled, simply prepared and made from fresh ingredients ... and I am fairly sure that when I bought my now-battered copy, it was one of just a few 'cooking for one or two' cookbooks on the market. Now it looks as if it is out of print, although Amazon lists a number of used copies available. Since we been getting involved in so many ethnic German activities throughout the Texas Hill Country, we have begun to have a deep appreciation for excellent sausages, like those from Granzin's Meat Market in Gruene... and for the many delightful ways to cook cabbage. My English Granny Dodie prepared it by lightly steaming chopped cabbage until it was just barely cooked, then tossing it with melted butter, cracked pepper and bits of crumbled bacon. I don't know from here she picked up this delicious heresy; the traditional English way of cooking cabbage is to boil it to death for many hours. But the traditional German way is to make sauerkraut out of it; basically, salted and pickled – the way to make a green vegetable last through the dark months of a northern winter – and so I have come to explore the many faces of red and green cabbage. 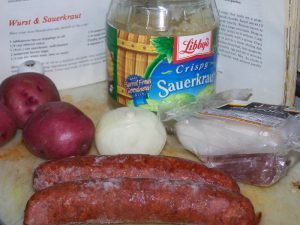 In Cookery for 1 of 2 there is one recipe for a one-pan wurst and sauerkraut dinner, which I adapted a little, by adding two quartered red potatoes, which essentially cooks your complete dinner in a single covered pan. Heat 1 Tbsp oil, bacon drippings, or render one thin slice of salt-pork cut in small dice, in a medium saucepan over medium heat. When the oil is hot (or the salt-pork rendered) add ¼ cup minced onion and sauté until tender. Add 1 8-oz. can or 1 cup of well-drained sauerkraut, 2 teaspoons brown sugar, 1/3 cup of dry white wine, beer, water – or (my addition) homemade chicken or vegetable broth, 1/8 teaspoon salt, ¼ caraway seeds and a twist of fresh-ground black pepper. The original recipe says to cover and simmer for half an hour, then add 4 wieners or 2 knackwursts and simmer for another fifteen minutes. 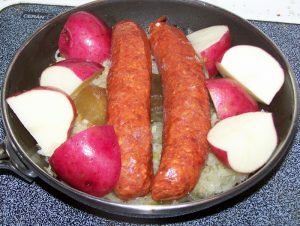 For my version, I add two or four smoked brats – it depends on the size of the brats and if they have been frozen – and two red potatoes, cut in quarters, cover and simmer the whole shebang for half and hour to forty minutes. The potatoes should be done, the sausages cooked through and the broth reduced and absorbed into the vegetables. Serve with a bit of whole-grain mustard on the side, and a salad of fresh garden greens. Total Teutonic bliss achieved ... and only one cooking pot to wash.